“I was first interested in how the Japanese could make fabulous joinery and shave thin shavings. I dug deeper and became even more fascinated by the philosophy behind Japanese woodworking. Thus began my relentless learning from YouTube. For 2 years, I watched all the videos on YouTube on woodworking and honed my skills. My skills improved a lot and fast, through many hours of learning and putting what I learnt into practice. However, my learning eventually plateaued. One can only learn that much from watching a video. Because when I watched YouTube and things like ‘a hair’s width’ is used, I wonder what a hair’s width was. What is the baseline? When I mark a line on a piece of stock and begin to chisel away, how close to the line do I stop? Tiny nuances like this example are things that one cannot learn simply by watching a video- and this began my quest to look for a master who could show me by doing, explaining and then giving pointers on what I can do better. When Suikoushya launched its Kickstarter, I did not hesitate and I was the first to commit to the month-long course. During the course, I received many valuable pointers on technique. Sensei told me what I was doing right and what I could do better. Positive affirmation is a way to learn as well; I knew what I was doing well and what I could improve on. Did you know that you can tell how much the blade of the kanna is protruding from the mouth simply by using the sense of hearing? How close to the line to chisel depended on how that face would affect the strength of the joint. Some lines were chiseled right in the middle of a pencil line, and some were left a hair’s width away; it all depends. More valuable were the visits that Sensei arranged – visits to blacksmiths workshops, lumber yards, hiking to see old natural stone mines, tool makers festival and a visit to a tateguya-shi’s workshop. 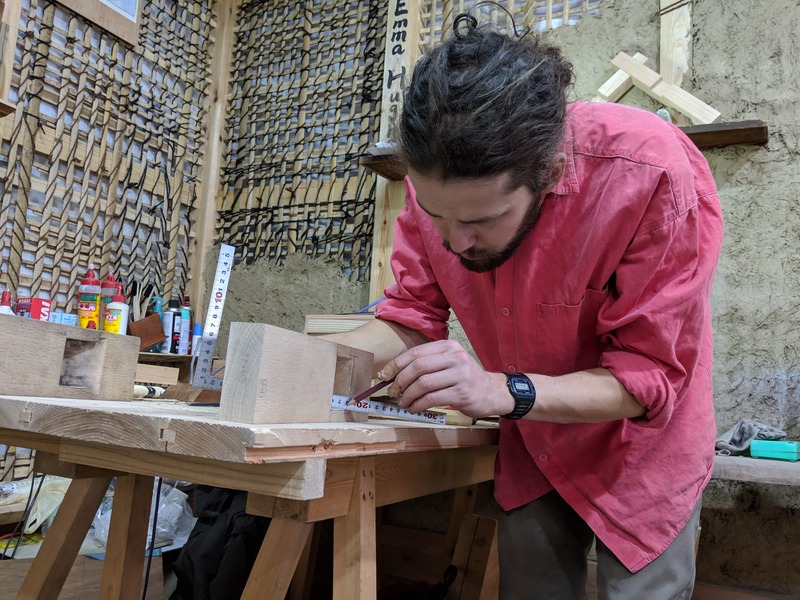 Though these visits, I could grasp what woodworking meant to the Japanese; and I could then bring these experiences back home to share with many others. I also particularly enjoyed the many hours of chatting during lunch to hear about Sensei’s experiences and anecdotes he would tell. Through these whole experiences, I could then truly be immersed into the sometimes secretive and hard to access the world of Japanese craft. “In Kyoto, my teacher was this Miyadaiku (shrine carpenter), and his deshi (apprentice)…” Begins the story I have retold many times. The time in Kyoto left a deep impression on me. I had come to Japan wanting to understand the spirit of craftsmanship and gain technical skill. The course had exceeded my expectations. Projects are planned in a progressive manner so that skills build upon each other. 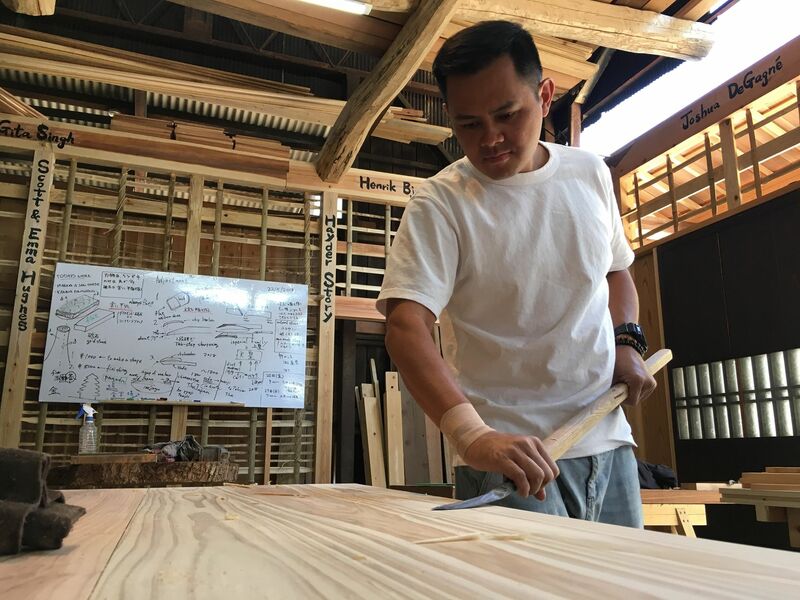 At the end, you will be equipped with fundamentals of tool maintenance, understanding wood, and hand-tool techniques to make joints. While you probably won’t have enough time to finish all the joints on the list, Ithink the foundation is there to take it further yourself. Learning happens through a variety of means – there are real life demonstrations, videos, drawings and a lot of self-practice. I liked the emphasis on caring for tools and keeping them in the best of condition. It is a practice of self-discipline so essential in craftsmanship. In today’s world where many things are measured in terms of convenience and short-cuts, it is precious. And best of all, the teachers embody what they teach. Other than the time in school, you can also go for your own “enrichment lessons”: visiting the tool shops around, craft museums and exhibitions in town, carpentry museums, Suikoushya workshops etc. Since Kyoto is a craft center, it’s a good location and offers a full experience. At Suikoushya, the teacher you learn from is someone knows his craft in both mind and body – as opposed to a teacher where there is a disconnect between what he teaches in theory and what he can actually do. Sensei also has a unique background having worked in Ise Jingu. He is someone who possesses valuable experience and skill. 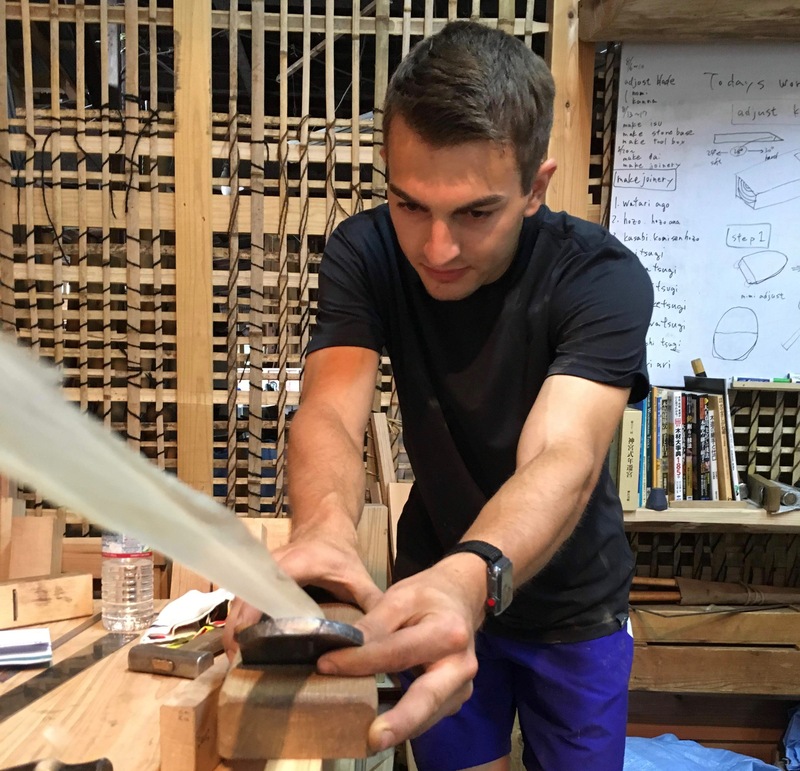 “Since I was completely new to Japanese woodworking and only had little experience working with western hand tools, I arrived in this school with big expectations but also with a feeling that my beginner level wouldn’t allow me to get the most out of the course. The first day, Sensei Takami Kawai, Dylan Iwakuni and myself sat down to talk about my experience, my expectations for the coming month and what I wanted to do with the knowledge I gathered at the school afterwards. We made a very personalized schedule, based on my skills and expectations. Since my future is headed towards furniture making, Sensei always kept this in mind and gave me the best advice on which tools were more suitable for me, which skills were most important and what I should practice afterwards as well. Only three months old, the school was already very professional. A combination of seeing Sensei’s technique, very elaborate explanations with the help of Dylan, videos and step-by-step plans on the school board and also room for practice by myself ( because a lot of the time it also comes down to repetition) made this a very pleasant and efficient way of learning the basics of Japanese woodworking. Sensei is obviously an amazing craftsman but also a great and patient teacher. I should also mention that while the course is officially from 9am to 3pm, I could be there from 8am to 8pm. And in those later hours, I could always ask Sensei or Dylan a question. Outside of the school we also went to various tool shops, lumber shops and had an amazing day in the countryside, watching a blacksmith making the tools that were later on used and seeing the effort that goes into making a traditional hand tool made me appreciate them even more ( and the importance of maintaining my own tools in the best way possible). So as I said, I started as a novice and went back with a strong foundation in Japanese woodworking but through contact with a student that came before me and is on a higher level as me, it is obvious that this course is suitable for anybody with a passion for Japanese woodworking, no matter what level you’re on. 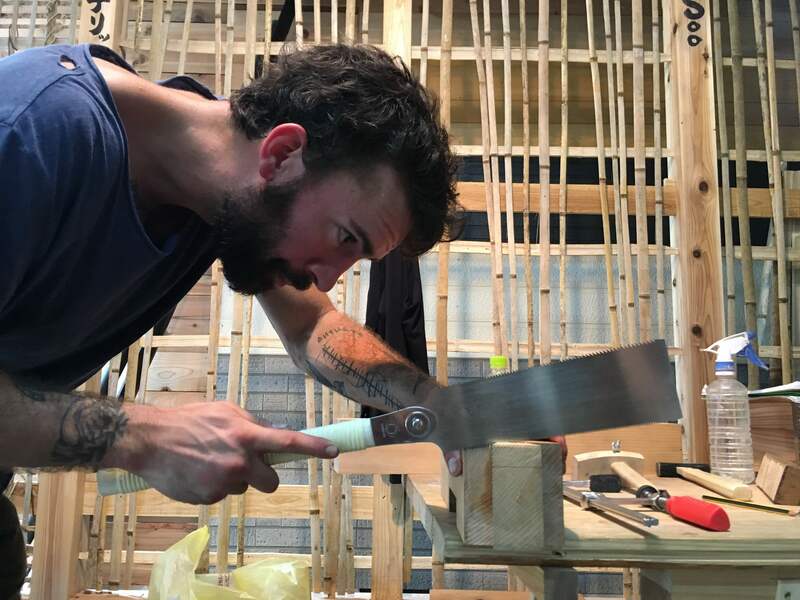 “It doesn’t matter if you’re a novice or an experienced woodworker/carpenter, if your serious about learning Japanese woodworking look no further. You will learn a lot and your skills, patience, and willpower will be put to the test. 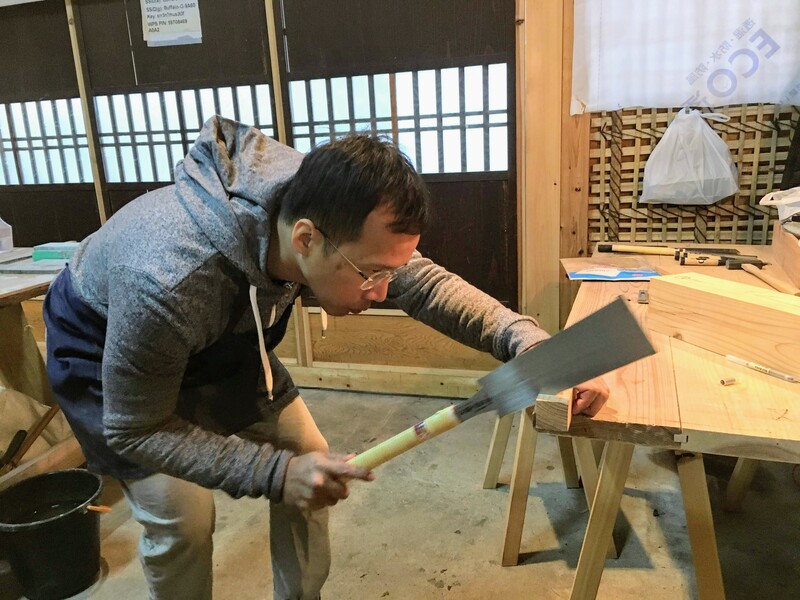 Being an experienced furniture maker, I came to Suikoushya with hopes to learn some of the staples of Japanese woodworking like using the various Kannas and understanding the joints. Sensei Takami Kawai, and apprentice translator Dylan Iwakuni taught us all of that and much much more. We had lessons on wood grain structure, harvesting, native Japanese species and tree selection. They brought us to many tool shops to purchase Kannas, blades, chisels, hammers, saws, sharpening stones etc. We were taught how to setup and maintain, and use everything we acquired. One day we traveled to see some local blacksmiths who were very nice and demonstrated how they forge chisels from raw steel. We visited their shop a few weeks earlier to buy a few speciality chisels, so it was awesome to see them being made. I really liked the format of the school, and I think it worked well for our group. The classes ran from 9am-5pm, however we could come in to work from 8am-8pm which is what I did most days. This way we could catch up on tool maintenance and sharpening, or work on joints and other projects. Believe me, there was always work to be done and not enough time. The area around the school is very quiet and pleasant, there is a children’s school and art college nearby. There is plenty of cheap good food within a block or two and a 7-11 within a 3 minute walk. Even at night there are a handful of Izakaya’s within walking distance that are good for small groups, delicious, and affordable. Arashiyama is about a 15 minute walk away with tons of restaurants and a few temples. If you’re interested in any of the locations shoot me a message and I can send you addresses. “To try to fill in what the other reviews missed: there’s a curriculum of sorts and official class is daily from 9 to 3. However you can and probably should stay back a few hours. I personally stayed on average to about 7pm. Sensei is usually around til 5 and is there with you in spirit and body. To give an example of how dedicated he is – when I made a wrong cut a day ago, he reminded me to adjust the other part. I totally forgot but he was able to remind me. Curriculum wise: Week 1 is sharpening and adjusting tools. Very painful and mentally draining but absolutely critical with the sensei the to guide you along when you’re lost in the cloudy haze of seeing your own reflection and wondering if you’re doing it right or going further down hell. Week 2 you start practising your saw, chisel and plane through practical work. 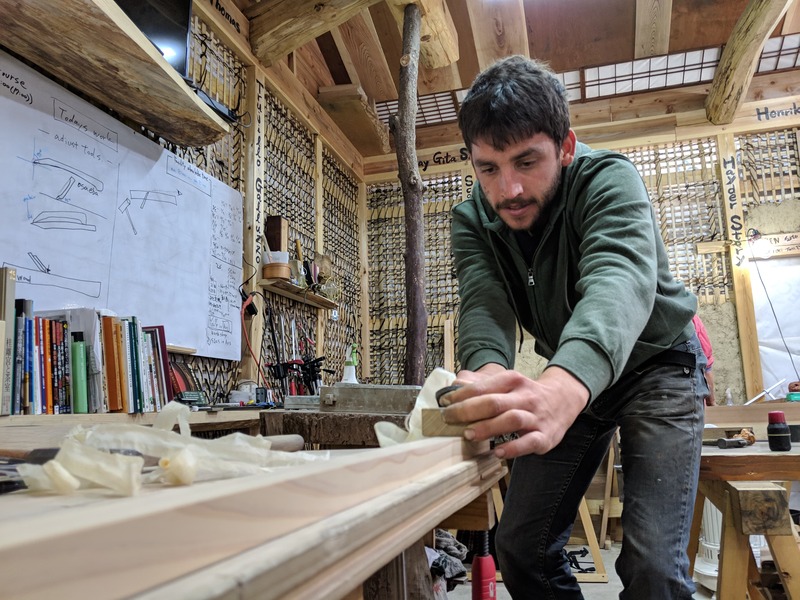 You will make a tool box and a whetstone base, and your fundamentals should be improved much and you’ll see how everything is connected. The muscle memory for sharpening tools translates into chiseling or paring for example. 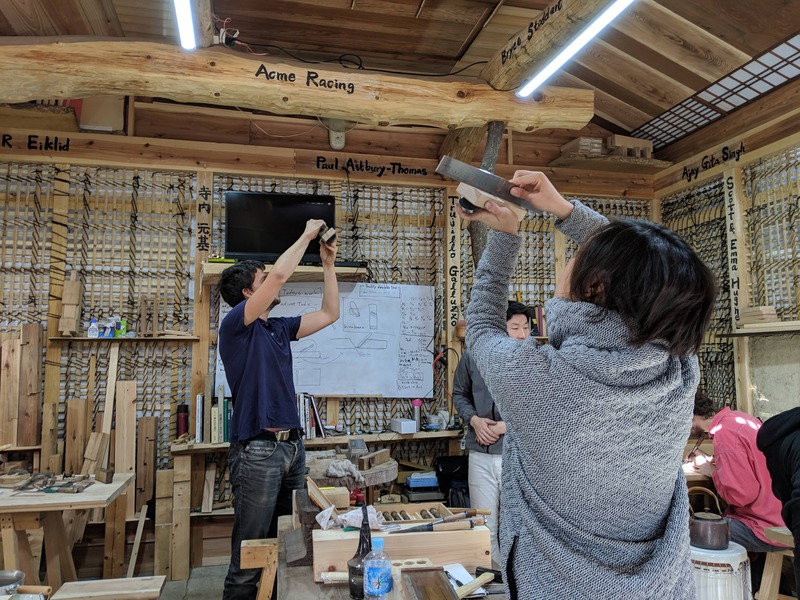 “The month-long woodworking course at Suikoushya International Craft school is a fantastic introduction to the art of traditional Japanese joinery. 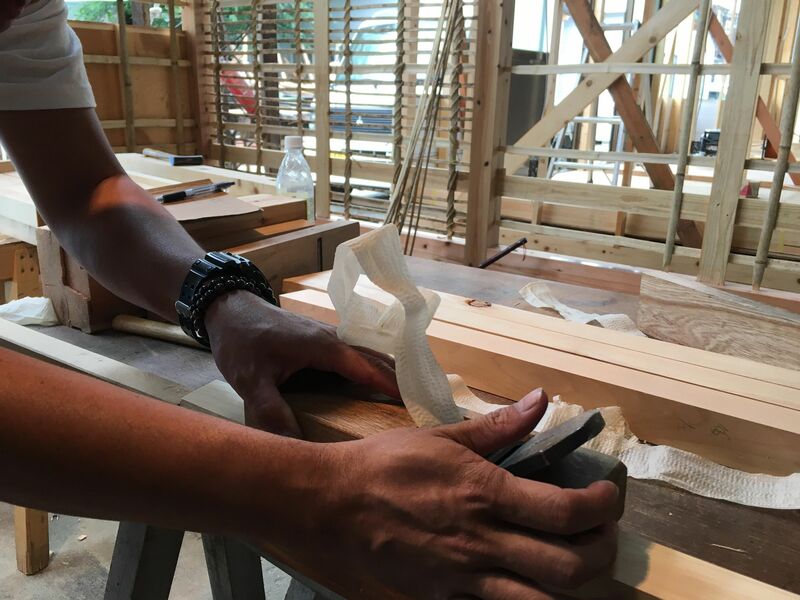 The course provides an introduction to both the tools and techniques of Japanese carpentry. Sensei Takami Kawai and translator Dylan Iwakuni are great teachers as well as fantastic carpenters. 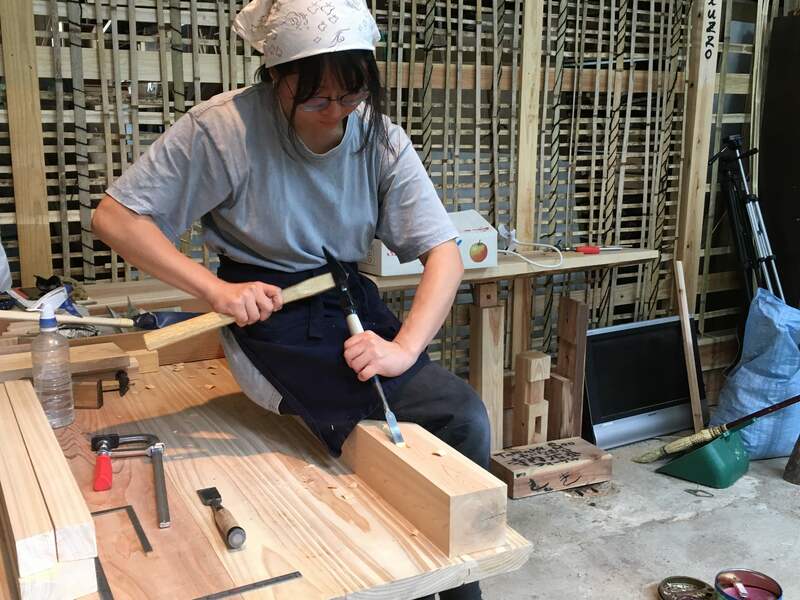 Their knowledge and love of Japanese carpentry and the traditional tools is infectious. “When I discovered Suikoushya’s Kickstarter, I pledged for the opportunity to learn something new. I am not a carpenter by any stretch and truthfully I knew so little about hand tools that I even had to learn how to use a saw correctly. But none of that phased Takami and Dylan. I feel that they truly enjoy sharing their world with others. However, my main takeaway from the half-course wasn’t the tools or the techniques but rather Takami’s philosophy – his way of doing things. By paying attention to the details and keeping at it, even I was able to create a joint I was proud of and all the while having fun. “I spent an amazing month in Suikoushya during the February 2019’s course. I have learned about tools and how important it is to have tools setted correctly. I think since I left the school I have always used that principle in my everyday life and also in my work as an engineer. I have also learned the best way to build in the most sustainable way whilst collaborating with the nature and not against it.